It’s a new beginning. Last Sunday, I shot my last wedding. I knew in my heart as I lifted the camera to my eye and photographed the most stunning bride and her husband, that this would be the end of my journey as a wedding photographer. In that moment, I also felt a hint of sadness as I watched the bride and groom so wrapped up in giddiness and excitement. They were now husband and wife. When I reflect back on my last four years as a wedding photographer, I see the person I have become. An observer. Being a wedding photographer taught me how to be in the moment as the whirr of the wedding day flashes by in just an instant. A memory that last’s a lifetime can happen in just one moment, and if you’re not in that moment, you will have missed it. Being a wedding photographer taught me how to observe and listen for those special moments. A traveler. Never in a million years did I think my work as a wedding photographer would take me to be up close and personal with the Eiffel Tower in Paris. Or in the middle of the quaint and romantic fields of a Long Island Vineyard as the sun was setting beyond a goldish pink sky. Or on the exotic beaches of Tobago amidst a warm breeze with sand underneath my feet. A leader. When you have 12+ people in a bridal party relying on you to direct and guide them into position for picture taking, you learn to be a leader. 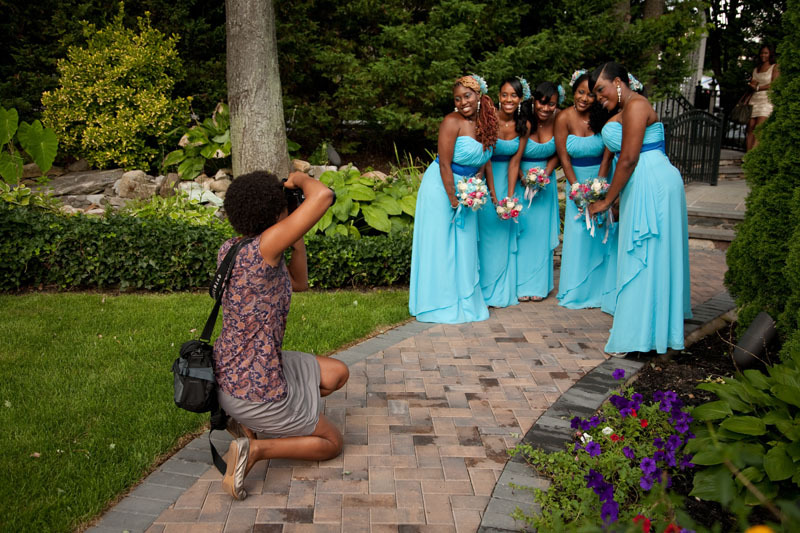 I’ve learned to go from a behind-the-scenes observer of the wedding day to a front-and-center composer of a photograph. Being in this role allowed me to see myself as the one who is relied upon and trusted to create my artistic vision in a matter of minutes. I’ve learned to put on my drill sergeant hat when the situation called for it. And to stay calm under pressure and have Plan B ready to go when Plan A was a no-go. And last but not least, being a wedding photographer allowed me to be....Myself. I’ve learned that when a client hires you to be their wedding photographer that it is a tremendous honor because 90% of the time, they are not hiring you for your photos; they are hiring you for you. I cannot tell you the amount of people who have approached me during a wedding to tell me how great I was and they hadn’t even seen the pictures yet! When hired as a wedding photographer, I know that the client hired me first, and my photos second. It is a liberating feeling to know that when you show up at a wedding ready to work, all you have to do is be yourself. And that if during the reception, you find yourself dancing right alongside the guests as the DJ plays your favorite song, it’s ok, you’re just being yourself. So, why if being a wedding photographer showed me so much, why am I leaving it? Because portraiture is where my heart is. When I am involved in a personal one-on-one session, whether it be headshots for a new business owner, an artist or creative, or even an engagement session, time no longer exists. And without the limitations of time, creativity abounds, there is no such thing as fear, and as if by magic, you become one with the moment. The person in front of my camera becomes my muse and my vision unfolds revealing organic beauty through a natural process of creation. During a portrait session there is a sense of knowing between myself and the client that everything right now in that moment, is perfect. Laughter, conversation, and personal connection becomes the fuel that results in a one-of-a-kind photograph. We’re involved in what seems like a creative tango where my client and I feed off of each other, inspired by each others unique expression. And as with all journeys that wind and unfold, I am moving deeper into my calling as a motivational life coach. It always amazes me how discovering photography was the very thing that led me to become a life coach. I’ll save the story of how that came to be for next time but know this: life has a funny way of tying your life together quite nicely if you don’t resist it. So here I am, a portrait photographer and motivational coach. I am following my passion for bringing out the best in people. I am good at it. It fuels me and fills me in a way that nothing else can. And so I am following where the heart strings pull. Thank you to everyone who has been a part of this journey with me. And to those I have yet to meet, I hope to connect with you soon.